A branch of the National Oceanic and Atmospheric Administration (NOAA) responsible for tracking hurricanes apologized Saturday for sharing a Facebook post critical of President Trump. 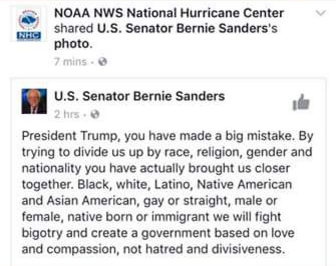 The National Hurricane Center (NHC), rather surprisingly, deleted the apology from its Facebook page, which claimed a “hacked” personal account was responsible for sharing a post by Vermont Sen. Bernie Sanders. NHC’s Facebook page shared a Sanders post highlighting Saturday’s march in Washington, D.C., in protest to Trump taking office. NHC then quietly deleted off its Facebook account, but not before meteorologist Dr. Ryan Maue captured a screenshot. Smullen did not address why NHC deleted its apology for the “political post” on its Facebook page. Bigger questions, however, have emerged. Who would “hack” NHC’s Facebook page? And why would it matter if a “personal account” was hacked? These are questions NOAA has yet to answer, but observers had some theories of their own. Meteorologist Ryan Hanrahan suggested the NHC “hack” was nothing more than an agency official accidentally posting to a government account, thinking it was their personal one. NHC’s Facebook snafu comes on the heels of the National Parks Service (NPS) retweeting a a New York Times reporter’s comparison of crowds at Trump’s inauguration to President Obama’s 2009 ceremony. Binyamin Appelbaum at TheNYT tweeted Friday: “Compare the crowds: 2009 inauguration at left, 2017 inauguration at right.” He featured side-to-side images of Trump and Obama’s first inaugurations. NPS apologized for the tweet, but not before being heavily criticized by the Trump administration. NPS will investigate whether or not its official account was “hacked” out of an “abundance of caution,” reports CNN. NPS was ordered to stop tweeting, except in emergency situations. NPS used to estimate the size of crowds, but stop doing so after they vastly overestimated the number of people at the “Million Man March” in 1995.